What is the benefit of 2 drive thru lanes at a fast food restaurant? 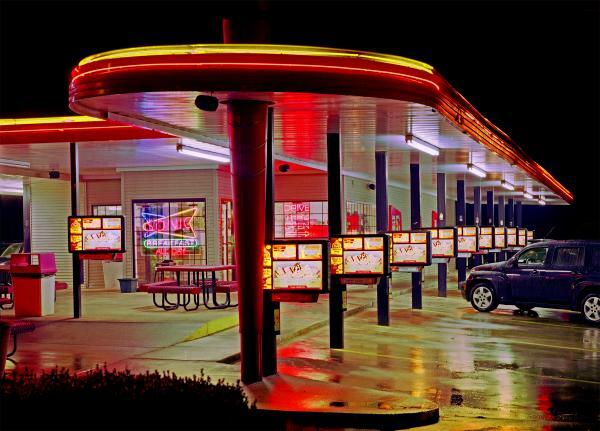 The following photo shows the drive thru lane at a fast food restaurant. 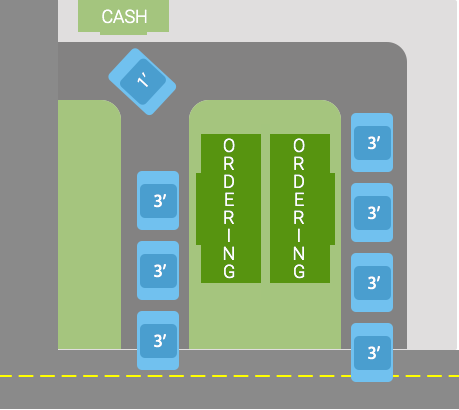 The lane splits in two to allow 2 drivers to place their order at the same time. As you can see, the two lanes converge back into one lane before the payment window. Therefore the payment and receipt of food is still done serially, which would seem to negate any benefit from orders being placed in parallel. In addition, there are downsides to having more than one drive thru lane. A driver in one lane might not pay any attention to the other lane, which would increase the risk of an accident. Also, due to orders being placed simultaneously, the person at the payment window repeats the order to each driver to confirm that the orders/drivers are in sync. On more than one occasion I have had the wrong order repeated to me. So what is the benefit of having two drive thru lanes? I am in the fast food business having owned five units for over 30 years but don't have a unit with two lanes. The reason for two lanes is a matter of timing from McDonald's research into this that I read years ago. (I am not with McDonalds.) It all comes down to timing and shaving 10 or 20 seconds off the time you wait in line is worth having. The slowest part in this queue is ordering. Not everyone is slow but the average is. And if one line gets bogged down by one customer, half of the other customers are in another line and continue to flow, hopefully. In addition, it makes the line look shorter. So it's partially psychological but combined with increase feedthrough it makes the customer experience better. It's better to be third in line of two lines than sixth in line of one line. Of course, sometimes it's a matter of parking space and two lines prevents cars from spilling out into the entrance from the street. This is how I look at things. First customer comes in and gets waited on right away. Everything is great. Second customer comes in but he's happy cause he's next! But the third customer in thinks, "Aw, man, how long is this going to take?" EDIT: The queuing theory, and all similar ideas, are very much applied to these things. Fast food operations are small factories that produce packages of meals no matter what anyone wants you to believe. Just like a plant, timing of operations is studied from before the restaurant opens to when a customer walks in the door to the time it closes. This flow is just as important as anything else. I know how long it should take for a single customer at the head of the line to get through to checkout. I know how long it should take for the customer at the end of the line, too. If it's taking longer than those max times, my people make adjustments like taking problem customers out of that flow. I've always said that, in my restaurants, if something goes seriously wrong at any point in our morning setup, it takes us a full 24 hours to recover. The customer won't always notice but we do. It's better for some situations like a quicker user gets through the line faster. Example: a car full of kids takes 3 minutes to order. A single person who knows what they want takes 30 seconds to order. By having two lanes, that single person has the ability to bypass the car full of kids. They get their food faster with minimal effect on the car full of kids. Let's say we have 2 rows of 4 cars and it takes 3 minutes to each car to make an order, plus 1 minute to pay. Since they're taking orders in parallel, it will take 12 minutes to each row to go through, plus 8 minutes for all cars to pay. it will take 32 minutes. Same case, with just one drive thru. The first 3-4 cars will just wait patiently. The other cars will grow impatient, and maybe even try to get out and go to another restaurant, causing trouble to the cars behind or getting stuck in the middle. Needless to say the amount of frustration will skyrocket. If you want more drama, try to picture this with 3 kids yelling and you'll get the perfect nightmare (and obviously, this user will never get back, granted). Same situation. Now you come with your car and see a long line of cars that gets to the road. Being smart, you say to yourself: is the time I will spend here worth it? Quite probably not, so you move out to another place. Consider the cases mentioned in my first point. Now let's say you need 10 cars to pay your employees, and you have only one employee per station (taking orders and cashier). For the purpose of this example, you work at full capacity 8 hours. One lane case: you need 2 employees, hence 20 cars. It will take them 100 minutes (20 x 4 minutes) and leave 380 minutes of remaining time. Now 380/4=92 so you saved a bit in employees wages, but your income will fall drastically, almost to half. Reduce time and/or reduce queue before the process starts. If the restaurant places two lanes then two clients can start the process at the same time or at least make two queues. I guess seeing a queue of cars might make potential clients go away, so if there are two lanes for the first step you reduce the amount of clients that haven't started the process to half (and move the queue to after the order). It is not the same to wait because one already ordered, than wait to order, because in this last case the client might simply leave. About reducing the time, as others have stated, the first step is the one that doesn't depend on the restaurant and might take more or less time depending on the client. In the case where only one person is taking orders, the time for each client would be the same as having one lane (no time reduced). However, there would be two short queues instead of one long (at the start). Car pulls up and car reads menu - that is 100% dead time for the order taker. It has a higher loading of taking order with the same manpower. Hence more orders process in the same period time. Both faster and more efficient. 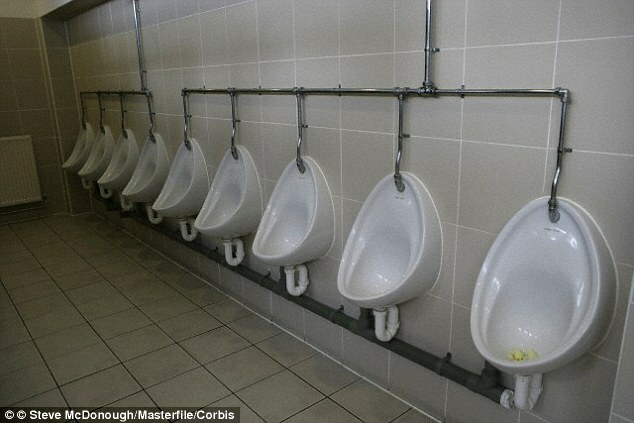 Just because you see 8 urinal stalls does not mean one also has to provide 8 doors, correct? The underlying point is that you need to provide more parallelism at the slower steps. Assuming, and I think it is a good assumption, that ordering takes more time than paying it makes perfect sense to have more ordering-windows than paying-windows. Lanes fan out at toll payment points on the highway. 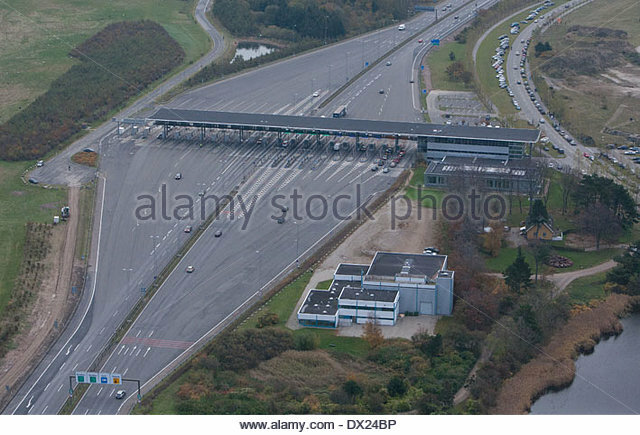 You may have a 2 lane tollway but 8 parallel toll booth lanes. You may have a dozen manual check in counters and weighing scales shared between two agents but only a single conveyor finally leads to the baggage sorting room. the payment and receipt of food is still done serially, which would seem to negate any benefit from orders being placed in parallel. There is no reason to assume this is true. The benefit for the user is getting their food faster because the restaurant can process more meals per hour, leading to shorter queues. There are two things to consider here to understand why the basic premise of this question is probably wrong. Simply moving from a concurrent step to a serial step does NOT negate the benefits of the earlier paralellism. Let's look at an analogous example from web development. We want to fetch data from two different servers (parallel processes) and then use that data to render text into a web page from top to bottom (serial process). If it takes 3 seconds to hit each server and 1ms to render the response from a server we can obviously either take 6 seconds or 3 seconds to finish the task depending on our choice of parallel or serial for the first step ONLY. The second step's parallelism changes the overall situation by 1ms, making it completely irrelevant. You see the same situation at the fast food restaurant. Time to take an order, create and package the food ~= 5 minutes. Time to take money and hand food through a window ~= 30 seconds. The parallelism of step 2 doesn't negate anything here. A system with a series of sequential steps is constrained ONLY by the slowest step. This is called theory of constraints. It has a wikipedia article too. The summary is that in a system with a chain (or even multiple converging or diverging chains) of processes that need to be completed, the system moves only as quickly as the slowest step. Attempts to optimise any step other than the slowest step have no positive impact and can even have a negative impact on overall productivity. 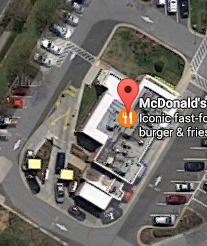 Your example of a fast food restaurant (or literally any other system in the world) has just one severely limiting factor at any point in time. Nothing else is worth optimising. Now also consider that the nothing can be done before you place the order yet preparing and delivering orders can be done in parallel with taking new orders. It also hints as to why perhaps having 2 lanes for orders makes sense but not 3, or 10 or 50 - this would be out of proportion for the size of the kitchen and other available facilities required to process burgers. One potential avenue for followup, would be whether this restaurant is really optimised for consistent user experience (latency) or just total revenue per square meter (throughput). As far as sending items concurrently through parallel/sequential processes goes, they are not necessarily the same thing. 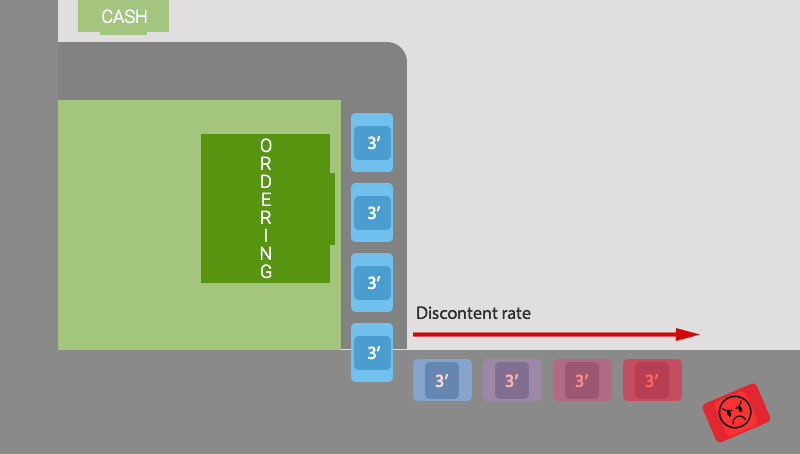 It's quite possible to optimise overall throughput in such a way that individual items may suffer additional latency (like when the OPs order is forgotten at the kiosk). This is a pure UX question. I did similar research for bank teller lanes in college. I will answer your question with one word - perception. When you drive up and see 5 cars ahead of you, you might be like "F that I will try somewhere else." They know once you order you will hardly ever leave. So they just want you ordering and don't want to lose your business. Your question has two lanes in the example... Sonic took this to the max as some of their locations have 40+ ordering points. It is all about perception as you are still in line. They just want you to think that the line is as short as possible until you order. I am not saying the other answers are wrong. They make valid points but they are all secondary to this point. 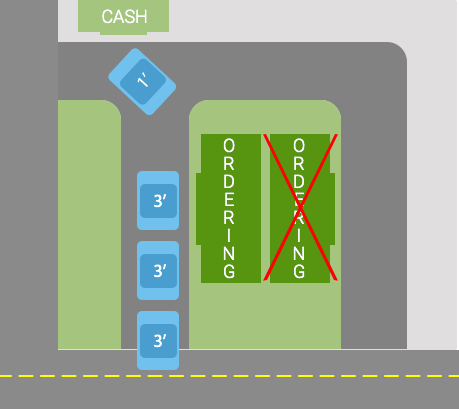 As you can see below, you can drive up and order right away at Sonic and you will be the first person in line ;). Pure speculation but it makes sense. Payment and receiving food are very quick. What takes the most time in any food place, including fast food, is food cooking/preparation. If they can get multiple peoples orders they can get all the food preparation out of the way and simply trade food for money at the window. Having worked in a McDonalds I'd say the main advantage of 2 windows is so that the orders are placed and they can start being made. It just means more orders can be placed faster. "the person at the payment window repeats the order to each driver to confirm that the orders/drivers are in sync", I know in England, the staff taking the orders get a video feed of the customer, this automatically takes a photo when the first option is placed on the order. The person at the payment window then gets a face next to the order to confirm who placed it. This doesn't always work because the pictures aren't always perfect but the majority of the time it works well. profile the situation and identify the bottleneck: ordering at the speakerbox takes a long time, much longer than it takes to get the meal and pay at the window. add more capacity to that bottleneck: double the number of speakerboxes. A lot of verbose answers here. The simple and short answer is that queueing theory tells us that multiple queues will reduce variance in wait times, while the average wait time will remain the same. Predictable wait time is always preferable in terms of UX, and although it's not the only factor, it also is better on the production side (imagine one person asks for a bottle neck item, and your entire production chain is blocked until you can deliver that item). The staff member taking the order must. Therefore it is very possible that one member of staff can operate two order windows, processing more customers, then if the customers were all at the same window. 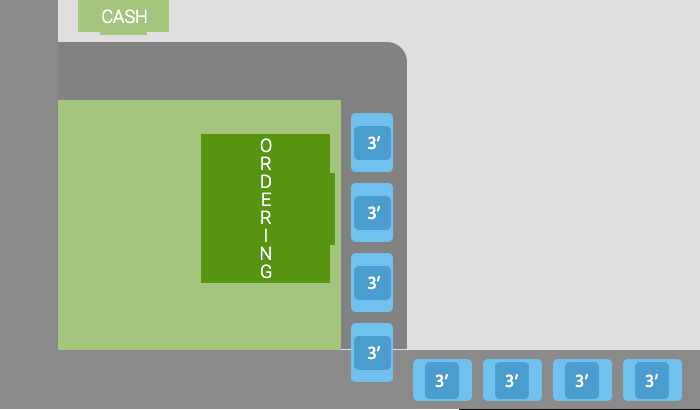 If the lines start to back up, it is very easy for a 2nd member of staff to step in for a few minutes, so it is then one member of staff per order “window”. Often this is done by one member of staff, however it is easy to see how the work at the payment and collection window can be split between two members of staff. Most of this work can be done while the preceding customer is getting out of the way and the next customer is driving to the window, so unlike the order window, the member of staff is not spending much time waiting for the customer. Just a comment that I didn't see addressed on this with all the perception/frustration commentary: Merging can be a stressful and annoying process. When you leave the double line and merge back into one, many drivers are paying vary close attention to the proper order of things, who came first into both lines, proper zipper merging when both cars are waiting to move forward, jerks, etc. Or simply having to make a choice and being stuck in the slow line after choosing. 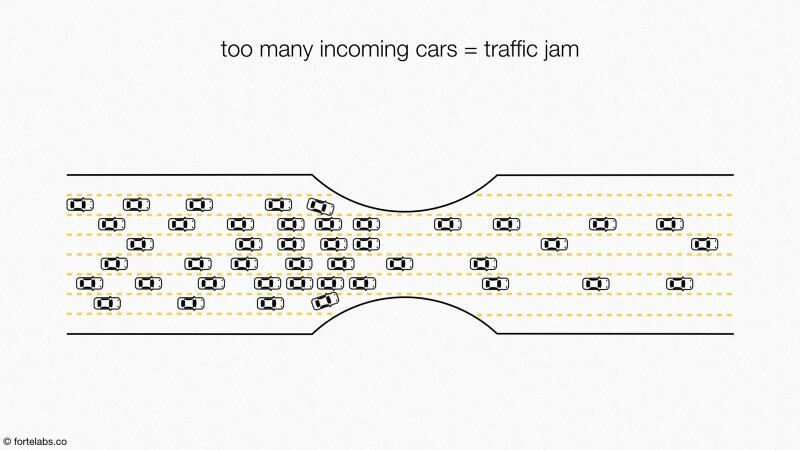 While not scientific, both myself and the person next to me at work sometimes prefer to avoid busy double line merging drive-throughs just because it adds stress to the process. More than potentially waiting longer elsewhere, even if the lines does move faster in absolute terms. Having two lanes only for the ordering step is the same of a person walking through the queue asking what they will order instead of waiting them to get to the cashier. And plus, if people order soon, they feel they haven't had to wait that much. "Your food isn't ready, park up and we'll bring it out to you when it is"
By having two lanes, orders are being taken twice as fast but everything else remains the same. Which means 2x more food can be cooked in the time it takes each car to get from entrance to collection. Having read all the answers so far, I feel like a mathematical approach can be of value. A waiting line/queue is typical version of a Markov-chain. 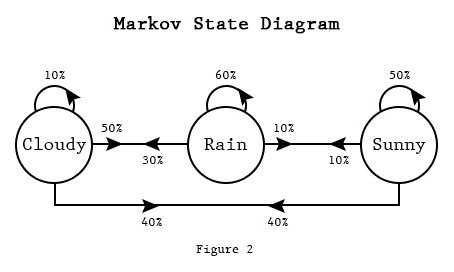 A Markov-chain is a network of states. For a waiting line, this are usually the nr of customers in the total system (the nr of customers waiting in line plus the nr of customers being served). States change according to a certain probability which is different for every state (transition probabilities). 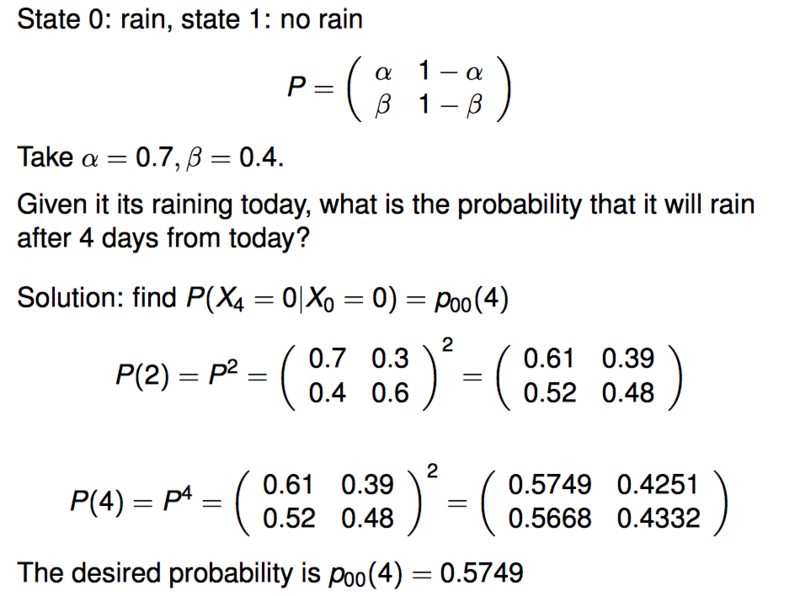 These probabilities are usually described by a Poisson process. A poisson process is a mathematical representation of probability over time (note that this is not entirely true but it does give an idea of how one could approach it). In other words: how many of a certain event do I expect over an amount of time. For instance: How many car accidents do occur on a certain junction in 10 days (If that is 2 that may seem very high but since there can be many cars passing, the probability of an accident happening when one passes the junction can be very low). A more on-topic example is, how many customers do I expect to arrive to the drive thru lane? This immediately brings up the question how much time will it take before the next customer arrives. We call this inter-arrival time. One can see that the values from P^2 to P^4 change less than the values from P^1 to P^2. What does this mean? Can we use it? Lets assume the values in matrix P^1 represent reality. Of course it doesn't, but lets assume it does. The truth is it converges to a point which is not dependent on the state of today anymore, because, the further in the future you go, the less today is of importance of the future. This describes the memory less property of an Exponential probability distribution. To find these so-called steady state probabilities, one should calculate the matrix P^Infinity. Sometimes this is easy, sometimes it's not because not all matrices/probabilities converge. Some matrices diverge. An illustration to this: What if the average interarrival time to the drive thru is larger than the average drive thru's service time, and the drive thru would be of infinite length? The system would "blow up" meaning that waiting times will only grow larger. In reality this is never the case since a drive thru has only a certain length. what can we do with the steady state probabilities? We can calculate the average waiting time of a customer in the system. We can calculate the amount of numbers expected to be in the system and we can calculate the expected utilisation of an operator (and many more things). Lets say a company adds a lot of value to service. Waiting is often regarded as not adding value to service, since, of course people don't want to wait. The company can now calculate the costs/benefits of having an extra operator/drive thru lane and see if that adds value to the company. Maybe the company now gets more customers since even though there are more customers in total, the total waiting time is lower. Something I'd also like to add is: I once made an analytical (markov chain) model for the parking garage of a hospital. This hospital had 2 entrances, one on the north side and one of the south side. The hospital asked me why, even though they had 2 entrances, people were still complaining about the waiting time. What was the case is that no one was using the north entrances because not many people arrived from that side. It is often better to have one central waiting line that separates into multiple servers. What is the best user interface you have ever used/seen in real-world or real-world objects? What are the benefits of non-QWERTY keyboards? What are the User Experience disciplines in the analog world? Headlight and Indicators on the handlebar OR on the front panel of the Scooter that you drive? What is the psychology behind road markings on lanes unaffected by speed cameras? Is there a benefit from driving on one side of the road, while sitting in the other side of the car? What is the purpose of jackets having small zipperless back pockets just below the neck? What color smartphone provides the best viewing experience? What is the rationale behind the way modern elevator dispatch systems are implemented?